Chateau / Country House2750 sq. ft. Perfectly situated on a Beautiful Tree Studded 5 acres, the main home is 2800 sq ft, features huge vaulted living room with pine ceilings, woodstove with gorgeous slate hearth, floor to ceiling windows that bring the beauty of the outdoors in, large family room with additional wood stove, slate hearth and wet bar, very large dining area perfect for entertaining, gourmet kitchen, breakfast nook, walk in pantry, indoor laundry, an oversized master bedroom, guest bedroom, and two baths. There are wood floors and vaulted ceilings throughout the home, a beautiful front deck and back slate patio areas, and greenhouse. There is a great new restaurant, gas station and market two minutes away for your convenience. Pets are welcome - please contact host for pre-approval prior to arrival. For larger groups there is also a nice sized 2 bedroom/2 bath house (VRBO# 726021) and an even larger sized 4 bedroom / 3 bath house (VRBO# 1198567) on adjacent properties . Please search those listings for availability and pricing. Long time resident of San Francisco with a new found love of Mariposa and the Yosemite area. Even though it rained almost our entire stay, our time there was still magical. I brought some friends up to celebrate my 30th birthday. We originally planned to go hiking in the valley if the weather allowed it but we ended up staying at the house the whole time. I brought some games and arts and Crafts, we cooked and danced around to music. We built a fort in the living room and created a cuddle puddle to watch the lightening storm. 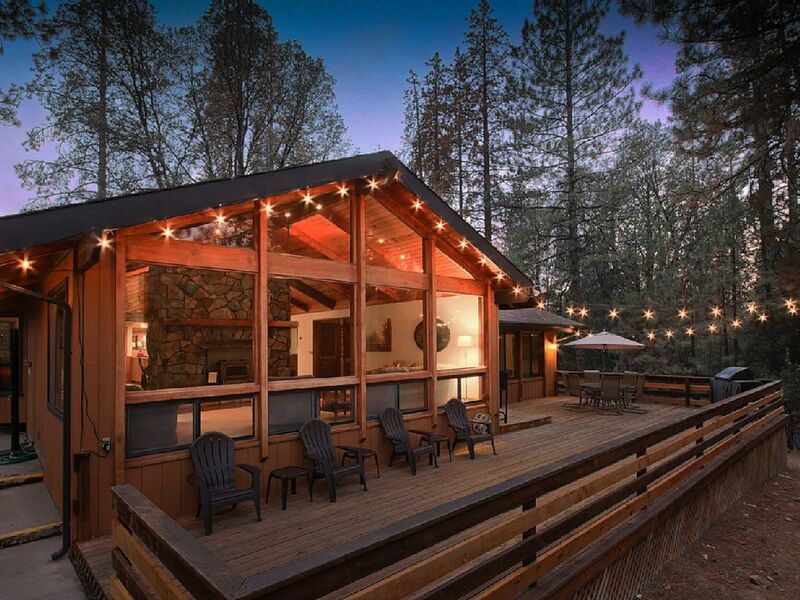 I definitely recommend this house to help create a memorable weekend! The coffee maker and blender both didn’t work. I fortunately go everywhere with my bullet and bialetti so it wasn’t an issue for us. They don’t have any shot glass or fancy glasses at the wet bar. No big deal, just making a note for future guests. What an amazing Place - our family and friends couldn't ask for anything more. From the Wall to Wall windows with amazing views to the super comfy beds, this was definitely one of the best vacations ever. The ride to the park was beautiful taking about 45 minutes. Coming back from a long day of hiking, we relaxed in the hot tub under the stars. Thanks again for a wonderful stay. My family and I had a great stay! The house is spacious and well-appointed. The kitchen was amazing to cook in, the hot tub was great, and we spent a lot of time on the porch enjoying the outdoors and views of the nearby mountains. Highly recommended! Amazing Mountain View, Huge Kitchen & Dining and Spacious Deck for Viewing! Fantastic time at this beautiful mountain home! Our family came from Michigan for our son's wedding in Oakhurst and this was perfect! Clean, well supplied linens, towels, (including hot tub towels) and kitchen items. We rented this home along the other two homes (VRBO#1198567 & #726021) on property which made it so convenient to have all our family together! We wished we could've rented this home one more day but it had already been reserved back in January-so book early for this property! One item that may have brought this star review from a 5 to a 4 would've been the burned garage and dumpster in front of the home but Steven Jeffe personally called me to let me know that they had a garage fire and he and his staff (who were courteous and helpful) were working hard to clean up the area. They accomplished this (5 stars for you! )and the area did not smell smoky or distract us in anyway from our great visit. Hearing of this fire helped us (being from rainy Michigan) to see first hand why California drought and fire conditions can be so devastating. We were thankful that Steven Jeffe explained his situation and we are grateful that the homes or any persons were not effected. Thank you Steven, we really loved our family meals sitting on the deck looking at the beautiful mountain and enjoying the hot tub in the evening! Thank you creating a place for us to enjoy this incredible wedding celebration! Yosemite National Park, Bass Lake, Lake McClure - just to name a few. 30 Minutes from Bass Lake.